Computer hardware and peripheral manufacturer Corsair has this week announced the availability of its new K63 Wireless Mechanical gaming keyboard and Gaming Lapboard Combo ref: CH-9515031-NA. Both of which are now available to purchase priced at $160. The Gaming Lapboard Combo has been created by Corsair to provide a complete wireless PC gaming control system that you can use from the comfort of your couch. Check out the promotional video below to learn more about the Corsair Wireless K63 Tenkeyless gaming keyboard an dit unique features when compared to its desktop counterparts. 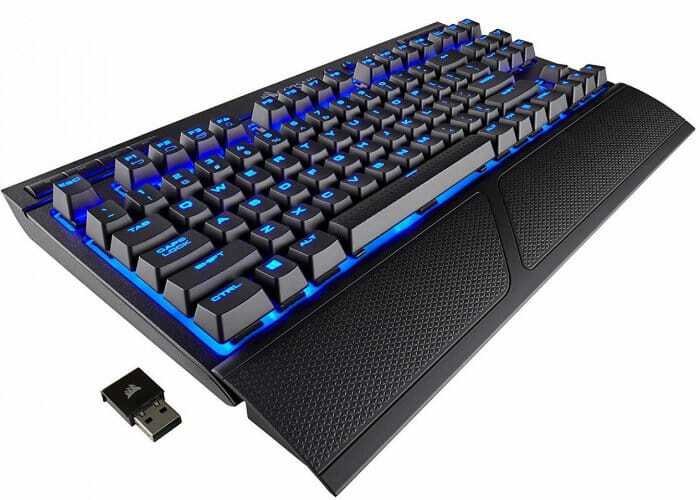 Features of the wireless mechanical gaming keyboard include the ability to connect using ultra-fast 1ms 2.4GHz gaming-optimised wireless technology, low latency Bluetooth wireless, or USB wired. The new Corsair mechanical keyboard is equipped with Cherry MX Red mechanical key switches with gold contacts for fast, precise key presses and fitted with per-key, blue LED backlighting and large font keycaps to deliver vibrant lighting effects. Other features include 128-bit AES encryption to help protect your keystrokes from wireless eavesdropping and keep your personal data safe, and portable, compact tenkeyless design saves on space. To learn more about the K63 wireless mechanical gaming keyboard and Gaming Lapboard Combo jump over to the official Corsair website by following the link below.